This can be a strange time of year for many anglers, rivers are gearing into full winter mode with ice starting to build in the higher elevation streams and many lakes are beginning to cap over with ice taking the chances of shore or boat fishing away. We have experienced some milder weather lately which has left us in a fall/winter limbo which can be especially difficult for the lake anglers. The good news for ice fisherman is it appears that we will get another decent storm system moving in this weekend or as early as the end of this week. Summit County, for example, is getting some precipitation currently then the storm moves on giving way to some cold, nightly temperatures which will be perfect for icing over the reservoirs. Most of the state can expect this storm to bring in some colder weather and possibly precipitation in a lot of counties. 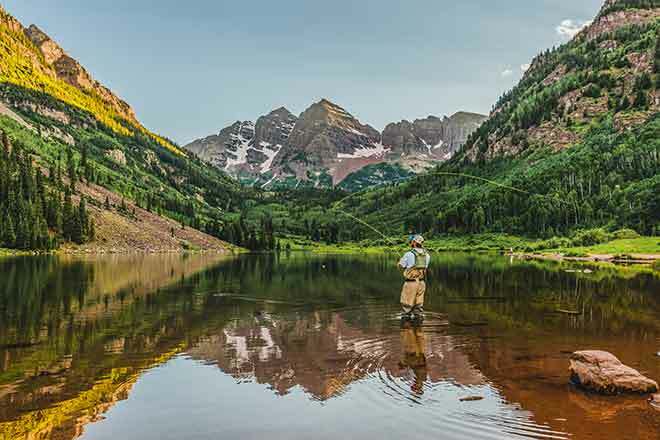 For reservoirs along the Front Range, the walleye and bass seasons are coming to a close but the trout bite is on. The rivers and streams are entering winter mode, especially in the higher elevations. Low flows, cold temperatures, and clear water mean the fish are stacking in the deeper pools and runs. Nymph and midge rigs will be the go to bugs moving forward but streamers are still going to get you fish for a couple more weeks. Send us pictures of those catches so you can show off your angling fame to your friends and family! As of 11/30/2018, reports are coming in that the ice has capped around 95 percent of the lake. It is slowly but surely starting to freeze over. Experts do warn with the mild temperatures recently that the ice is not very thick in many areas and if the wind picks up, the ice will become even more unstable so best to avoid ice fishing the reservoir for now. The forecast is showing some colder temperatures around the corner, in particular, this weekend. Keep an eye on reports or contact a local bait and tackle shop to get the most current ice conditions before heading out there. Based off of the late, fall fishing reports, many anglers are expecting the early ice fishing to be excellent for trout and bring in new pike fishing opportunities. Kokanee fishing could also pick up as it was very slow in the fall. Guides suggest that January is going to be about the time to expect the salmon fishing to get better. As of 11/26/2018, Spinney Mountain State Park has closed for the season. As of 11/30/2018, ice at the reservoir has been reported at around 6-8 inches thick in areas. Although that is sufficient for walking on, we are still in the early ice fishing season window and South Park has had mild weather like a lot of the state so caution is advised when heading out there. The fishing reports are really good so far this season. Anglers are experiencing 30 minutes to an hour of nonstop action then an hour or two of no bites. Guides suggest the fish are cruising around in search of food so patience could be key if you find a decent spot. Anglers are having luck close to shore but at the edge of the weed lines where there is depth but still close to the thick vegetation. As of 11/30/2018, there is no safe ice yet and water temperatures have been close to 40 degrees with the mild weather we have been having. The lake is about 15 feet down but slowly rising. The fishing is rated fair for walleye, crappie and wiper. The reservoir is closed to boating. The inlet is on and outlet is off. As of 11/30/2018, the walleye are still biting in particular that vampire shift at night. During the day anglers are getting good catches around 25-30 feet of water when vertical jigging slap Rapalas and jigging Rapalas. At night the walleye are moving to the shallows chasing bait fish so shad imitations are working well. Crappie are also a hot item on the reservoir right now and hitting live baits especially minnows. Pro Rogue in the clown colorations are doing very well for both the walleye and the crappie at the moment. The bass fishing has been very slow but some reports of catches are still coming in. Right now is a good opportunity to take advantage of the remaining open water fishing before the bite really slows down for the winter. As of 11/30/2018, The lake is at 714 surface acres with a surface elevation of 6183.16. Surface water temperatures are around 35-40 degrees. South Shore fishermen are catching trout on homemade dough bait, PowerBait (green color) and worms all along the shoreline which has been decent with all species of fish. The river at Reilly Canyon has slowed down to a trickle and heavy willows/vegetation has emerged around the lake. The most action for fish is occurring in the early mornings and late evenings. Ice has been forming in the protected coves, but is still extremely thin. Boating is closed for the season. This 762-acre impoundment is located off of E. Quincy Avenue, two miles east of E-470. As of 11/30/2018, the reservoir is closed to boating which includes all hand launched watercraft such as canoes, kayaks, float tubes etc. Trout fishing from shore has been really good lately! Best areas have been from the dam using PowerBait from a slip rig and bright colored spoons and spinners. Some nice size rainbows from 16-20 inch ranges have been caught recently. For more information call 303-326-8425. Park hours December 7:00am-5:30pm. Closed December 25th. This 881-acre impoundment is located in Cherry Creek State Park, in Aurora. There are two entrances to the park, the east entrance off S. Dayton St. and the west entrance off S. Parker Rd. As of 11/30/2018, not much new for Cherry Creek. The fishing has been reported as fair and the walleye bite is wrapping up like the rest of the metro reservoirs. Some walleye can still be caught using shallow reactionary bite techniques but the fishing will most likely be inconsistent. This 1,356 impoundment is located in Chatfield State Park. As of 11/30/2018, the walleye bite has tailed off and will probably be about done here soon for the season. A few reports are still coming in with some catches but they have been few and far between lately. The bass fishing has remained decent as it also is coming to its end. The smallmouths will be found in their typical stomping grounds such as the gravel pits, on rocky points, and along the shelves. The trout bite is what has really picked up lately and should continue to be decent as we head into ice fishing season, granted this year's weather allows for it in the metro area. As of 11/30/2018, the ice has been getting thicker by the day. The roads are in good shape and accessible. There are about 3 inches of snow on top of the ice. The last ice measurement at Lake John was about 5 and a half inches. The fishing is good right now with mealworms, wax worms, and HD Ice Lures. All roads are accessible at Cowdrey and the Delaney's. Cowdrey measured at about 6 inches of ice but there is still some open water so be careful while on the lake. All of the Delaney's measured between 5.5-6 inches of ice and have about 3 inches of snow cover on the ice. As of 11/30/2018, ice has been forming nicely along the banks of the reservoir especially in the Iola Basin. Reports of about 8 inches of ice in areas closer to shore. The ice does taper off so be careful if you are trying to get out away from the shorelines. Really good reports of trout are coming in lately but not much in terms of kokanee or lake trout. Ice anglers are catching trout off of chartreuse-colored jigs tipped with mealworms and gold minnow baits at about 10-15 feet of water. When the ice caps over sufficiently in the deeper areas of the lake, look to start using tube jigs in the white, pumpkin seed or even green colors to fish for the lake trout. It is still early ice season so extra caution is needed and the buddy system is vital while out there. Check in with a local tackle shop to get the latest ice conditions as they will change daily.